While breakfast is arguably the best meal the Deece serves, students with various dietary restrictions may be disappointed. What fun is breakfast on a relaxed Saturday morning if you can’t indulge in a plate of pancakes with maple syrup? Sure, the Deece has gluten-free waffles and pancakes, but they aren’t as good as homemade. And honestly, even though I can eat gluten, sometimes it’s nice to dine at home on a Saturday morning. Last Saturday, two friends and I gathered in my TA to cook a decadent breakfast. Even on weekends that are full of homework and meetings, I like to set aside Saturday morning for self-care. What a privilege it was to spend that morning chatting and enjoying homemade breakfast with people I love! My friends and I decided to make pancakes—a classic—but had to find a recipe that was both glutenand dairy-free. Luckily, with the help of a number of lifestyle blogs, this goal was not out of our reach. We settled on a recipe from the blog Love & Zest, which appears to be run by a sports dietician. That means these pancakes are healthy, right? The recipe we made called for a banana, eggs, almond milk, apple cider vinegar, vanilla, coconut flour, baking soda, salt and, most importantly, cinnamon. It certainly requires more ingredients and time than the two-ingredient alternative that is also gluten and dairy-free. 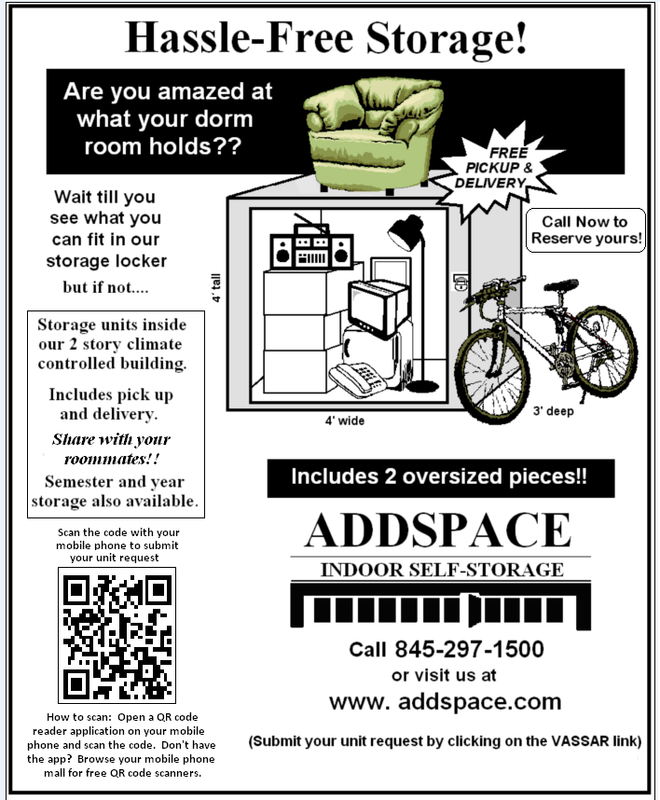 If you live a dorm, you may prefer the simpler version, described below. 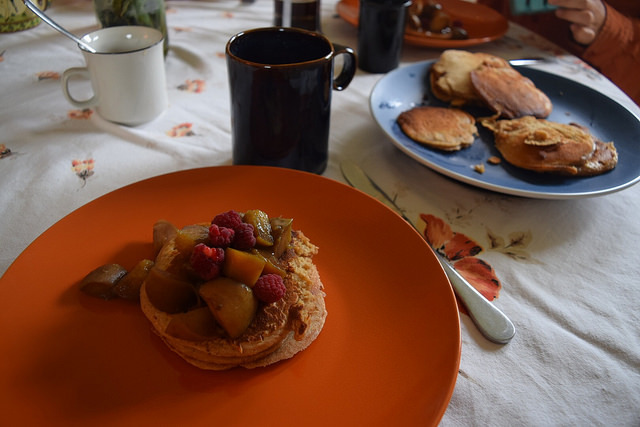 My housemates and I are fortunate to receive a CSA share from the Poughkeepsie Farm Project, so we had fresh raspberries and peaches to top off the pancakes. However, if you don’t have fresh berries, I’d highly recommend topping these pancakes with cooked apples. As my housemates will tell you, I’ve recently become a cooked apple fanatic, and they are perfect to pair with these pancakes. No one will judge you for singing, “I like to eat, eat, eat apples and bananas” for the next week! For the simple variation, you just need one banana (easily found in the Retreat or the Deece) and two large eggs. Before you start mixing up your ingredients, you’ll want to start heating up your skillet—cast iron or nonstick are best, but any skillet will do—on medium and add a small amount of butter, vegetable oil or coconut oil to grease the pan. Mix the banana and egg with a fork or whisk. Once the skillet is hot, you can decrease the heat to medium-low. To determine the right moment to flip your pancakes, look for popping air bubbles on the surface. If you’re looking for a more complex version of this recipe, which for some god-forsaken reason my friends and I were, the instructions are as follows. Again, you’re going to want to start by setting your stove on medium heat and greasing your skillet. Next, combine flour, baking soda, salt and cinnamon in a small mixing bowl. In a separate bowl, preferably a large one, mix together the wet ingredients. Add the dry ingredients to the banana/egg mixture and stir until combined. Spoon two tablespoons batter onto skillet and spread with spoon to form pancake. When my friends and I were making these, I did not follow this instruction, and my first pancake was a lump of batter that crumbled when I tried to flip it. Learn from my mistakes and make small, flat pancakes. Once again, flip when you see air bubbles popping on the surface and/or when the bottom side is golden brown. Enjoy cooking up this healthy breakfast!